The LG 84LM960V is the first widely distributed Ultra HD resolution TV to launch in the UK, and measures a massive 84 inches. This next generation television standard has yet to take off commercially, not least because the codec required to make it a manageable format for transmission and distribution hasn't even been standardised, but that's not about to stop TV makers eager to break new ground early. 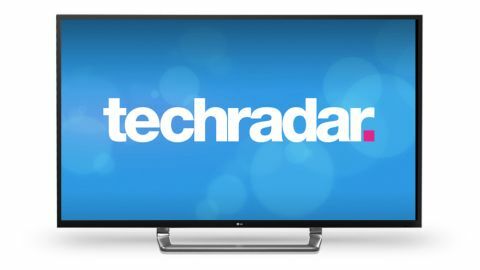 Initially available in 10 stores, including John Lewis Sloane Square, Bentalls Kingston and Richer Sounds Southampton, the LG 84LM960V effectively redefines the high-end of the consumer TV market. Offering a native panel resolution of 3840 x 2160 pixels, the LG 84LM960V foreshadows the next era of broadcasting tech, and at 84 inches it's comfortably the largest TV set that LG has ever sold. It's also ruinously expensive, but there's no doubting the quality of finish. Build quality is imperious, all brushed aluminium and glass. The swiveling pedestal stand is similarly substantial - but it has to be, as the whole ensemble weighs a back-breaking 79kg (174 lbs). The TV ships with two remote controls - a generic LG IR zapper and the wand-style AN-MR300 RF Magic Remote. Plus it has a party pack of gaudy Passive 3D glasses - a pair of Passive clip-ons plus two Dual Play specs that enable simultaneous split screen gaming. Of course, for £22,500 (around AU$34,943/US$36,645), though, you could be forgiven for expecting James Cameron to turn up to install it for you as well. Despite its premium trappings, the LG 84LM960V sports much the same feature set as its Full HD stablemates. It offers an integrated smart TV portal, with network functionality and, of course, 3D. The various catch-up and on-demand services available mirror those found elsewhere, but that's no bad thing. There's BBC iPlayer, Netflix, Lovefilm, YouTube, DailyMotion, Accu Weather, Picasa and a whole lot more - plus a variety of 3D content and causal games. The TV offers two tuner choices, either standard Freeview HD or DVB-S2 satellite. The latter can be used with a Sky dish feed, and offers an uncurated channel listing that apes what you'll get from Freesat. Back panel connectivity is solid. There are four HDMI inputs, three USBs, component via an adaptor, PC VGA and Ethernet. Only HDMI can be used to input a UHD 3840 x 2160 signal. If you have a spare external USB hard drive, you can timeshift from the TV or use the drive as a cache for pausing and replaying live television. But of course, with only a single tuner available, this is more a convenience nicety than PVR replacement. Naturally, the TV has integrated Wi-Fi too. There's also a Wi-Fi Share mode, which enables the use of Wi-Fi Direct and WiDi. The LG 84LM960V performs the usual 2D to 3D conversion trickery, which is at its most effective with still images. Obviously the dimensional effect is somewhat unpredictable, but there's something delightfully ViewMaster about the results.